No need to send out an ABP on me. I haven’t been abducted by aliens and I didn’t run away to join the circus (although both options would be quite the adventure and the circus has crossed my mind more than once in the last 3 weeks…) I have been travelling with work and unable to sit down and properly fill you in on my life as it happens. I could say life’s been “busy” but you’d be like “no guff, everyone is busy and hasn’t busy become the norm now, so that’s no excuse”. And you are right, who doesn’t go to bed and suddenly remembers that they forgot to email someone back or spends the night tossing and turning because they forgot to pick up toilet paper and hoping there is enough tissue paper in the box, in case it really was the last roll. I don’t buy in bulk so yes, this is a frequent concern of mine. There just isn’t enough hours in the day for anyone so telling you I’ve been busy just isn’t going to fly. Instead, I’m going to pretend that we are having brunch and do a Q&A recap to fill you in. How’s work? Fantastic! Just had our national alignment meetings in Montreal last week. Finally feel like I have an understanding of what my role is and really excited about my new projects for the year. I’m also going to be taking wine classes because well, it’s part of my job! How’s Stella & Dot? Has been on the backburner this month but just got my new samples and they are so nice! No really, there are some really great pieces so check out my site! You still working for KIND? Heck ya, I love the bars and the shifts have been so much fun. How’s the family? Dad’s doing great but Mom got pneumonia. She was hit bad but luckily she is on the road to recovery. M & N are excited about moving into their new home next weekend. G & T are trying to decide what day to go and pierce Little Lu’s ears, or at least I hope that’s what they are doing because they seem to ignore every text I send out about her getting her ears pierced. I will not let this die and my niece will thank me in the future when she comes over and raids my S&D stash! You still have the cats? Yes and the cat hair is driving me bazooka bananas! I can’t stand it. I tried to give them back but the shelter has already taken in too many animals and they are busy trying to change the by-laws so that owners can’t leave their dogs out in extreme weather. It’s actually amazing work that they are doing so you should head over to their facebook page and read how you can support them: go on, I’ll wait! I’ll suffer (I say that loosely because the cats are very lovely) awhile longer with the cat hair if it means that there is one less dog left out in the cold. But I’ll tell you, I won’t become a crazy cat lady, crazy maybe but no cats in this lady’s future. Unless they are hairless but I don’t want a cat that looks like a rat. How was the eat clean challenge? (in my head I’m wondering how talking about cats leads you to clean eating but out loud I respond) Really good! I actually enjoyed making myself dinner and have made some of the meals again. Will try to cook more often now that my travelling is over. You hair looks different? Oh thanks, I think. Different as in good or different as in bad? Just different. Ya, I attempted to dye it red myself, I think what you are seeing is that I didn’t fully distribute the colour and it looks like very oddly placed highlights. It’s suppose to wash out in 28 washes. 4 down, 24 to go. What book are you reading? I just finished Imposter Bride by Nancy Richler. Was pretty good. Maybe if I had read it at a less “busier” time it would have been more interesting but it didn’t really grab my attention. But I wanted to finish it and find out what happens so it wasn’t all bad. What are you reading next? Going to read the Book Thief. I’ve read great reviews about it. Have you been going to the gym? OMG, Did you see this tweet about Justin Bieber getting arrested! I show you my phone and with that you walk away. Brunch over. Preparing to form a habit! Tomorrow is the first day back to work after a restful holiday. I am not a morning person and I’m not a winter person so I know the hardest part will be waking up early tomorrow and trekking out in the snow that has been consistently falling since this morning. I am however excited to get this year started. The last 5 years have been a bit of a struggle, whether I’ve been dealing with my dad’s illness, my self-inflicted unemployment or my never ending struggle to get my life in order, there is always something that has been weighing on my shoulders. In life there are rough waters and calm seas so I’m happy that the last couple of months have been a bit of smooth sailing. Life is always full of surprises so I know that I must take advantage of this time in my life by focusing on getting into some healthy habits that will help keep me sane the next time that the waves get a little choppy. One of my 2014 intentions is to start being greener and healthier. 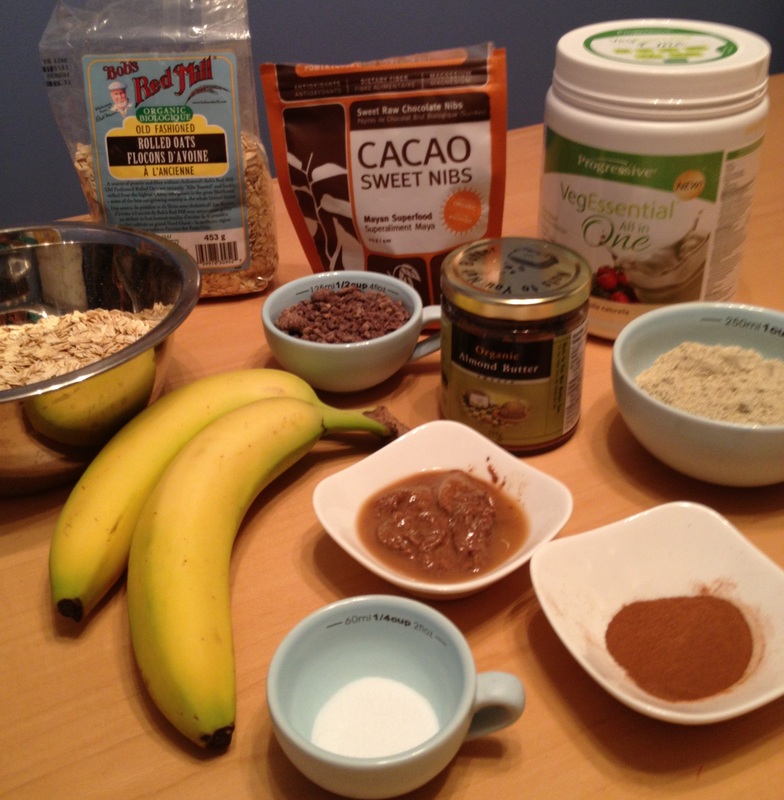 I want to be more aware of the foods that I eat and of the products that I use. I’m the first to admit that I never read the labels on anything so this will probably be an eye-opening experience. Since January is the month to kick start healthy eating habits, I eagerly signed up for a 6 day eat clean challenge that was posted by a blogger I follow. They say the key to staying on track is to prepare so today I bought all the ingredients and rolled up my sleeves to get everything ready for the week. It actually felt good to clean out the fridge and my cupboards. I had a box of shake’n bake in there from 2011 so it was long overdue. It felt even better when prepping everything turned out easier than I had stressed it would be. 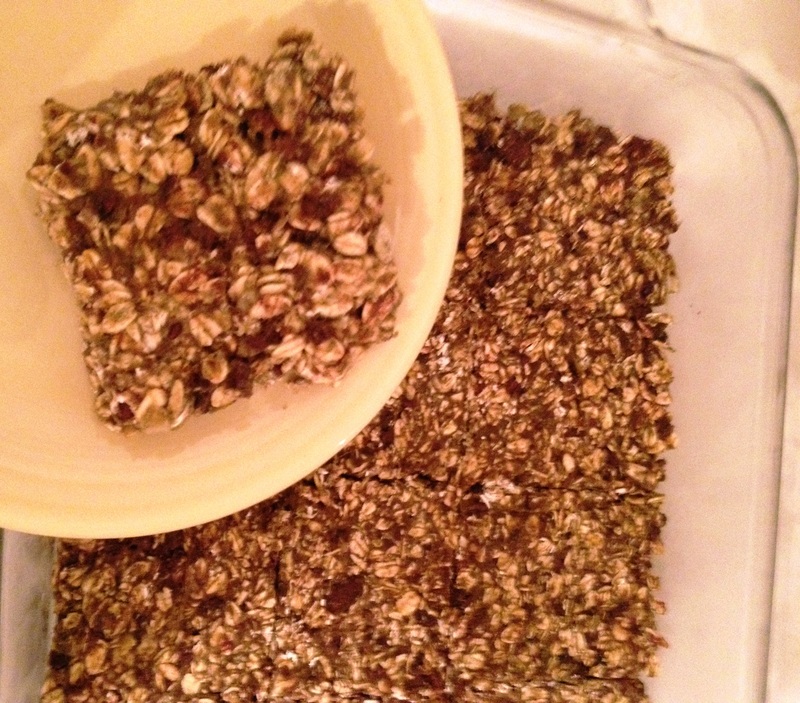 By far the easiest was the protein bars that I can make ahead and snack on through out the week. 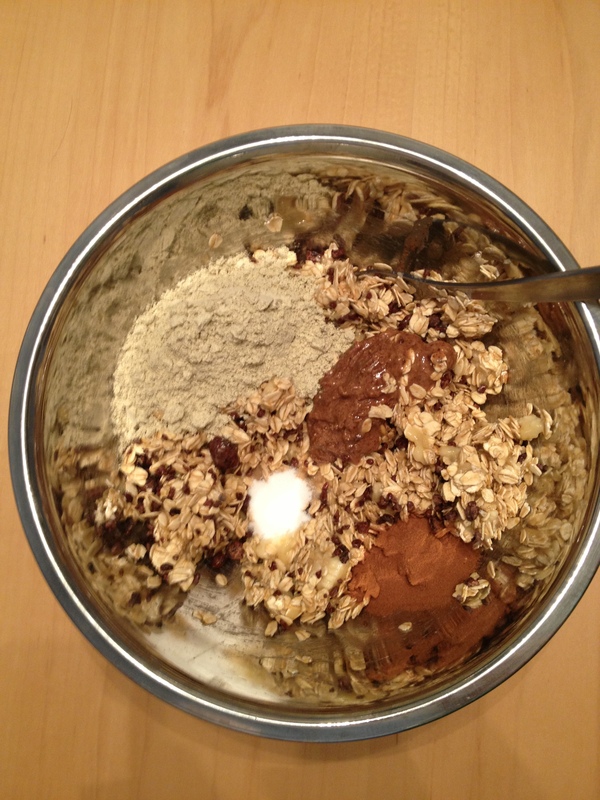 Step 3 – flatten the mixture in a square tray and put in freezer for 3o mins and Voila! and the best part was that they actually taste good! With my lunch made, tomorrow’s dinner already prepared and delicious homemade protein bars in case of hunger, I am excited to start the challenge and see what other healthy habits will stick this year.